Game description: Genji: Dawn of the Samurai is an intense 3D action-adventure game. Inspired by the 11th century Japanese literary masterpiece, "Tale of Genji," Genji: Dawn of the Samurai provides a dramatic samurai plot fused with fantastical Japanese mythology. 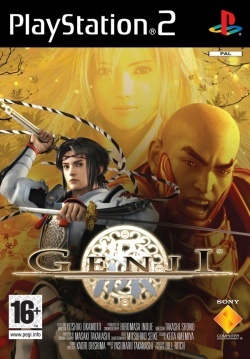 This historic samurai tale is set against the beautiful and elegant environments of feudal Japan, and delivers a story of two noble warriors engaged in a crusade against mythical forces controlling Japan. In addition, Genji: Dawn of the Samurai features authentic swordplay choreographed by Japan's leading swordsman, and production directed by acclaimed industry veterans. Gameplay is third-person combat. The player controls Yoshitsune or Benkei, and both characters are equipped with two basic attacks: Normal and Special. Yoshitsune is your archetypical fast and agile warrior, making up in speed what he lacks in strength. He is able to jump on small platforms (which, if jumped on by Benkei, would collapse). He wields two swords, and can also use his sword to 'hang' onto a ledge before jumping again, allowing him a double jump of sorts. Benkei is the more powerful but slower character, with greater range than Yoshitsune. He uses a large war club, which can also be used to destroy certain structures and heavy doors in the game. Description: Post-processing effects are not visible in hardware mode. This page was last edited on 1 February 2018, at 16:07.